ATG car detailing services in Surrey provide full service, high-standard car care to for those looking for the perfect finish. Using only the best equipment and materials, your car can be cleaned, polished and restored to as-new finish inside and out. And as-well as removing swirls and scratches, your detail can last longer with the latest ceramic coatings. Give your car a full detox and restore a smooth, shiny and easy to clean finish. From £150 + vat. 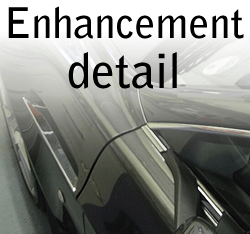 Enhance gloss and remove light defects and swirl marks. Protects all surfaces for high gloss and easy care. From £240 + vat. Multiple stage polishing removes swirls, scratches and moderate/heavy defects. Ideal for cars needing more paint correction and/or those looking for the perfect shine. From £395 + vat. Starting from the ground-up your car receives a complete decontamination treatment to ensure your car is spotlessly clean. Only once the paint, wheels and engine are thoroughly cleansed can the polishing commence. 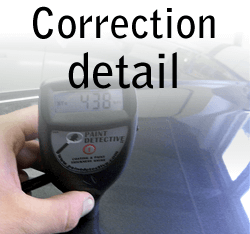 Using the latest machine polishers our paint correction services ensure all defects are removed. The machine polishing stages remove swirl marks, light scratches & other microscopic imperfections that all take away from showroom condition paint. In short; the smoother the paint the better the gloss. Swapping outdated methods for the latest machines and polishes give you the best possible finish without any holograms, buffer trails or other unsightly imperfections. Your car will never look better. Get a free no-obligation quote and get your car swirl-free today! Swirl mark removal, high gloss machine polishing, paint correction, caliper painting, leather treatments, glass sealants, wheel removal for deep cleaning, engine detailing, nano ceramic paint protection & finish with interior detailing for the perfect job. All of our car detailing services can be carried out at any undercover location in Surrey or at our dedicated detailing workshop in Guildford. Book online using our detailing booking form to arrange a time that suits you! Please review our terms & conditions when making a booking. 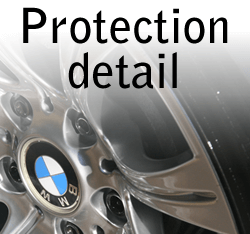 As well as having years of experience detailing cars, all work is carried out with only the best products. No job is rushed and you receive our full attention to detail to ensure maximum shine. To book (or just for a chat if you’ve got any questions about car detailing services in Surrey) call today on 01483 346344. We make cars shine in our car detailing workshop in Guildford, Surrey. But we also offer a mobile service which operates in Surrey. As a guide the following towns are areas which we regularly service but not restricted to: Weybridge, Cobham, Esher, Epsom, Guildford, Woking, Redhill & Leatherhead. Give us a call for a Free No-Obligation Quote Today on 01483 346344!